This absolutely gorgeous, large format book is a toddler's dream (and shhh ... an adult's dream, too). Featuring animals from all over the world, double page spreads showcase two 'unknown' countries with background scenery (desert, jungle, ocean, islands) and the endemic animals--birds, mammals, reptiles, fish--of that particular region. Ole Könnecke's iconic illustrations provide a feast for the eyes of readers large and small--and I simply loved guessing which region or country each page might represent. Australia was pretty easy! and we share space with our neighbours, New Zealand--unless Kiwis have made it across the ditch! 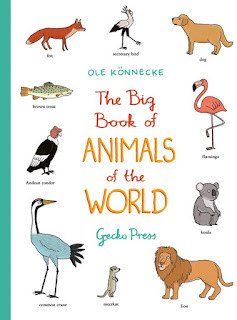 A world map at the end of the book help kids understand and identify which animals come from where. Just loverly, loverly, and a welcome large format that little ones can really, almost literally throw their little bodies into.